A classic early reader in print makes a beautiful digital transition! The Cat in the Hat is obviously a 'must have' in any collection, whether it's a digital library or a set of hardcover books with gilded pages. This version is no exception, with bright beautiful pictures of the beloved classic Dr. Seuss. For the read-a-long effect, each word is highlighted as it is read. 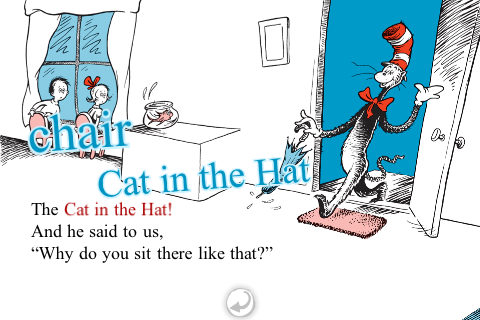 Although each page is essentially a still image, many pages begin by panning over Seuss' classic original artwork, zooming in and out to show off each segment of text, a nice semi-animated style. Otherwise, the book has no real animation, although most of the items pictured in the story react to a light tap with a visual image of the word with accompanying audio (for example, tap on the ball and the word 'ball' appears with audio saying “ball”). These word 'interactions' are literally hidden all over every page (for example, touch in a blank area within the house & 'house' appears on the screen). The words that appear refer to the characters and items around the house, as well as concepts like “wet” when touching the rain streaked window or “play” when touching the bike (this confused my child a bit). All of the Dr. Seuss book apps have this same style of interaction. It isn't bad at first, but it repeats indefinitely as long as the child keeps touching the screen. If the child touches the screen over and over in the same spot, the word appears over and over in a cascade of letters that fills the screen along with accompanied audio of the word repeating rapidly. Thankfully new updates allow users to turn this feature off, for young readers who need less distraction. February 2011: An update to this & the other Seuss apps has reduced the number of times the interactive 'words' appear, greatly reducing my son's desire to 'over-tap' - very responsive developer with an eye on the educational needs of young pre-readers! September 2012: Update includes the addition of a page guide, additional settings for sound and the ability to record your own narration. These setting also allow for tappable images within the book app to be turned off, a useful feature for both silent reading and in educational settings. The whimsical cat in the tall red & white striped hat and red bow-tie, arrives at the doorstep of two children, a boy (who is the narrator of the story) and his sister Sally. Later we are introduced to a fish, two odd critters called 'thing one' and 'thing two' and an assortment of items in the house that become playthings for the cat (like the hoe used to twirl the platter of birthday cake). The cat proceeds to take charge of an otherwise boring rainy day by wrecking havoc in the family home while their mother is out. The worry-wort fish repeatedly warns of grave danger if the shenanigans don't stop, but the kids seem powerless to stop the mayhem which shows in their faces, upturned in looks of perpetual surprise. Eventually the boy asserts himself and orders everyone to help clean up. Order is gradually restored to the house before mother arrives home.